While David Fisher’s Twirling Tower is not the first rotating tower we’ve spotted (Dubai Tower Clocks the Sun), and not the first that generates power from the wind (Wind Shaped Kinetic Pavilion), it’s definitely the first to pack this type of power. 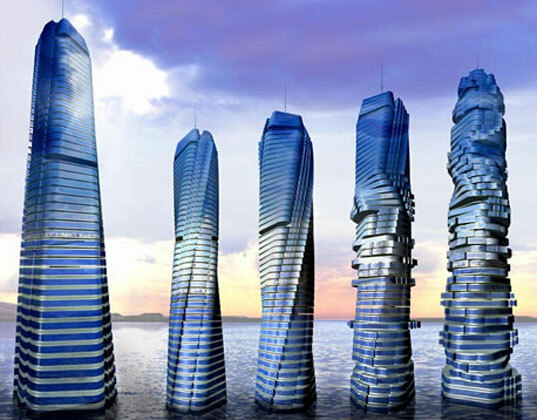 Designer David Fisher claims his Twirling Tower can not only generate enough energy to power itself, but it will also generate enough energy to power ten additional buildings similarly sized. While details on the tower’s true ability to generate electricity have not been proven, we are definitely a fan of those willing to search out new ideas. What differentiates David’s Tower from other moving towers is the integration of a large wind turbine sandwiched between each floor giving the tower its potential for energy. Inserted at every other floor, the turbines alone might be enough of an energy generator to stop residences heads from spinning, giving the penthouse owners at the top of the building the ability to control their view rotating to their hearts content. One might imagine that such a unique tower would be destined for the Dubai skyline, but Fischer plans to build this tower in a place only fitting of its energy potential, in the windy city of Chicago. Thanks Michael for the Tip! The "Dr." needs to do his homeowrk. The WIndy City of Chicago isn't called that because it has more wind, it was a reference to the political bickering that went on here, i.e, "windbags".. Boston is a windier city than Chicago. Given the constant exposure to blowing sand in Dubai and frozen precipitation in Moscow, the performance of a moving building having such a complex nature is not realistic. So much opportunity for failure. David Fischer is NOT the first architect to design a rotating building and not only that I know an architect who designed this exact idea in the late 1900's. Including all David Fischers ideas, choice of view, generators, rotating capability and flexibility with the aesthetics of the structure. When I saw this, and saw that he claimed it as his own my jaw dropped! It is a complete knock-off. Want more information regarding this just let me know. I sense the good "Dr." is not really a Dr. Note on an older version of the "Dynamic Architecture" web site he claims that he has an honorary doctorate from Columbia University. There are no longer any direct links to this page from the site, but it is still accessible with a simple Google search... http://www.dynamicarchitecture.net/Design.htm "On account of his academic achievements and research activities, Fisher was awarded an Honorees Cause Ph.D by the Prodeo Institute at the Columbia University in New York." There is no such institute at Columbia. At the recent version of this page located at the following address, http://www.dynamicarchitecture.net/21-06-08/new-web_23-06-08/the-architect.html, the claim is retracted. I suspect the "Dr." is stretching the truth a bit. A charlatan with a unique idea is still just a charlatan... Investors, watch your pocketbooks. A dangerous place for window washers! I think it's great... The idea is almost science fiction - and tomorrows future is todays science fiction? Even if this project isn't flawless it will give birth to many more..? I don't believe we should ever fear to dare our creativity in to reality. one question pop up from my mind..................how about the pipework and other services? wiring can go wireless now, but the waste pipe, drain pipe, water supply pipe, - does it mean that all services need to be allocated at the centre of the building? i am just curious were are they going to get all the people they need to live in all the building that they are building? YAAAAAAAAAY FOR TECHNOLOGY!!!!! Long live the Jetsons!!!!! It is my belief that suite vollard owns the patent for this technology and David Fisher is infringing on this patent. Be careful if you get involved with Dynamic on any projects. This building is kind of gimmicky and has attracted lots of buzz and hype, but realistically it is tackling some very practical issues like self contained power generation, equal lighting for all the sub units, and dynamic plumbing, electrical and hvac. Furthermore the fact that levels and pieces are built away from the construction site in factories is also brilliant. This is safer, and saves lots of time and money. This alone is a huge step for skyscraper construction that will be copied by even static buildings. Better yet, this will actually be built. Looking for a David Fisher who graduated from Francisso High School in 1957. I am sending off you e-mail from Turkey Ankara,Serdar Engineering.All the time I believe that the groun stone of living is dynamism and it explain us reality of life.For that reason dynamic skyscraper is wonderful structure being gained the very harmonic motion in its Unity.Isuppose during the sunset time the harmonic motion would be excellent.On the other hand anumber of engineering troubles cuold have been solved in this twirling wind power tower.I congratulate all memebers of technical staff for construction ofmagnifying masterpiece. I hope it's Chicago, whatever the life of the building is , FANTASTIC, It will be expensive to live there, that's what gets things built. I'm surprised to see so many negative posts, regarding both aesthetic and functional aspects of this building. As a fan of kinetic architecture, I personally like the project. It's a novel idea to propose a tower that is forever changing it's visual profile, yet not affecting it's footprint. As for moving parts that break, the CN Tower in Toronto has a rotating restaurant level which has been in use since the 70's, without problems as far as I know. Rotating floors would move so slowly it would be barely peceptible by occupants, such as the CN Tower has done. Seems like the rotating floor plates and the wind power generation would be 2 seperate architectural elements. The division between floor plates would have the rotating "fans" and the rotation of the floors themselves would not be required to produce energy, in fact they would only use up a substantial amount of it in the rotating floor process. Regarding electrical / mechanical systems and elevators - all static components would be tied into a central core raceway, to allow for waste drainage and such. It's done all the time, though not to accomodate rotating floors. I hope the designer furthers the idea to a buildable prototype. With reference to all the Dubai comments, I believe the article states that it is their hope to build in Chicago. Hard to take this seriously . . . might as well propose a building with a perpetual motion machine in it. An obvious question would be where do the stairs/elevators and plumbing go? The central column is going to get really crowded since it's also the structural support for the entire building. The claim of it generating enough power for 10 other buildings is, uh, ludicrous . . .
Dubai? Read the last line of the article, people. Build it and within 15 years the blades and floors will no longer turn, it'll be considered a waste of money. olga>obviously the design has no concern with the habitate environment. just another "green" gimick. which one is more energy efficient: a stable residential tower with a wind tower build next to it or a moving residential tower. The more moving parts there are, the more opprtunities there are for upkeep and maintenance problems. My hesitation with it is the ability of a floor to stop as well as the speed of rotation. You don't want people getting nauseated or dizzy from the spin. Also the noise levels. Turbines are loud, I wonder how that would work. Lastly, the more parts, the more room for error. This mass of self-contained entities leaves room for very large malfunctions. I think that's what Clara was saying in her comment--that alternative energy's a good thing. Assume it actually produces the electricity it promises, isn't it was gross waste of material to build each floor as a self-contained wheel? "It is wise that we should use wind power or sun power or even rain power to empower us to rely less on our power stations." What exactly do you mean by this? Isn't it the point to rely less on our power stations, most of which use unsustainable forms of energy production, and more on our site? Why wouldn't you want to combine this technology with the sun seeking technology, where the building would use the wind power/stored power to rotate some type of solar generators to face the sun at all times? It seems stupid to have these rotating floors where there is zero benefit to having the floors spin, and as far as the building being an eyesore, why not just make the building cylindrical so that the morphing effect is diminished. It is wise that we should use wind power or sun power or even rain power to empower us to rely less on our power stations. If this is being built in Dubai, just imagine howmuch sand will get stuck inthere after another one of those sandstorms. While I, too, am a fan of "those willing to search for new ideas," there's a reason Dubai (capital of tacky, second only to Las Vegas) is the city in which the first of these will be built. There's something awfully theme-parkish and tacky about these morphing buildings. I don't believe it's a trend that will catch on. Sacraficing the cityscape for something like this is too much to ask... plus, I seriously question how green (and how technologically sound) these buildings truly are. While David Fisher's Twirling Tower is not the first rotating tower we've spotted (Dubai Tower Clocks the Sun), and not the first that generates power from the wind (Wind Shaped Kinetic Pavilion), it's definitely the first to pack this type of power. Designer David Fisher claims his Twirling Tower can not only generate enough energy to power itself, but it will also generate enough energy to power ten additional buildings similarly sized. While details on the tower's true ability to generate electricity have not been proven, we are definitely a fan of those willing to search out new ideas.